LONDON: Uruguay's volatile star Luis Suarez's propensity for biting opponents stems from his under-privileged childhood, a leading sports psychologist told the BBC. The 27-year-old Liverpool striker – who has been banned for lengthy periods for two previous biting incidents – is alleged to have bitten Italy defender Giorgio Chiellini in their World Cup Group D game on Tuesday. Governing body FIFA are investigating the incident and if found guilty of biting he could face a ban of up to 24 matches. "The formative years of people's development do contribute to their personality. If you look at his history, Suarez had a fairly hard upbringing (he was one of seven children born into poverty), which would have been fighting for survival - he was streetwise," Dr Tom Fawcett from Salford University told the BBC on Wednesday. Fawcett claimed that nobody should be surprised at the incident which has yet to be proven and which was not seen by Mexican referee Marco Rodriguez. TV images showed Suarez bending his head down onto Chiellini's shoulder and then immediately afterwards sitting on the ground fiddling with his teeth. "If it's happened before, it'll happen again," Fawcett said. "Despite all the help, he's going to do it again." Fawcett said that Suarez required more help than just spending some time undergoing therapy with people such as him as the problem was so deeply etched in his psyche. "I would suggest he is hard-wired in this way," said Fawcett. "It's not something that's going to come out of his character with a few sessions with a psychologist. "Despite working with Liverpool in fairly impressive rehab, he's relapsed and he's open to that." Fawcett didn't offer up much hope that this problem would be resolved any time soon. "It's in the man. I would think that in five years' time, if there was a certain nerve hit or chord rung with Suarez in a different situation, he would react in the same way." Suarez, who had shown his better side when he scored twice in the 2-1 win over England last week just a month after undergoing knee surgery, had shrugged off the incident when he spoke to Uruguayan TV after the game. "These are just things that happen out on the pitch," the striker told Channel 10. "It was just the two of us inside the area and he bumped into me with his shoulder, and that's how my eye (it showed swelling under the right one) got like this as well." 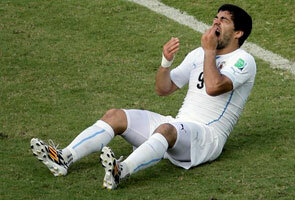 Fawcett added that Suarez's temperament could not cope with high octane encounters where there was a lot at stake. "He's a talented footballer but very vulnerable in intense situations, and Italy versus Uruguay was always going to be hot-tempered," said Fawcett. The Uruguayan Football Association has until 2000 GMT on Wednesday to respond to the bite allegations.